Haiti, the first black-led republic in the world, gained independence in 1804 as part of a successful slave revolution. The slaves in Saint-Domingue revolted and fought against one of the most sophisticated army at the time because they believe that all man are equal and that slavery should be abolished. Now how can you understand this today. An Australian Foundation came up with a report recently listing Haiti as the second country with the highest per capita globally engaging in modern day slavery after India. According to the report, about two percent of the Haitian population are living as forced child labor known as "restavec"
The Martelly-Lamothe government does not support this result. As a matter of fact, the government is using this opportunity to explain that "Bagay Yo Pa Pi Mal Pase Sa" (Things are not too bad) under his government. The government of Michel Martelly took the opportunity to repeat the most popular sentences of thi government "Se Pou La Premyer Foi"
According to the government, they have targeted the root causes of child domestic through the development of a free education program. 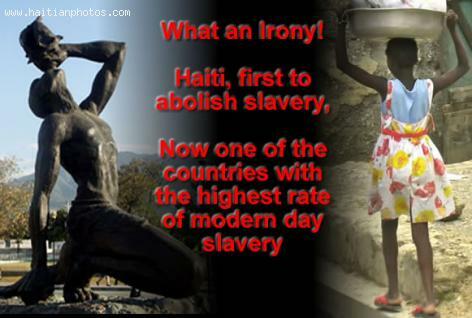 they also launched numerous initiatives aimed at ending the practice of child labor in Haiti.